Late 18th or early 19th century Russian ornately painted and carved sleigh with a carved shell front. 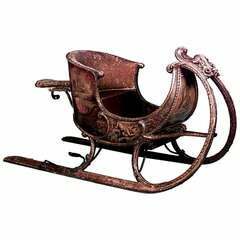 Late eighteenth or early nineteenth century carved two person sleigh painted with traditional landscapes and scenes of courtly love. Russian (18th-19th century) large painted and gilt trimmed carved sleigh with green velvet seat. Russian silver religious icon (19th century). 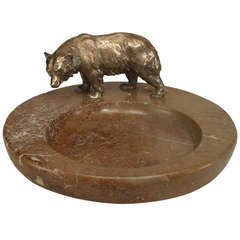 Turn of the century Austrian ashtray with a round brown marble base decorated with a small, free-standing bear of silver-plated bronze. 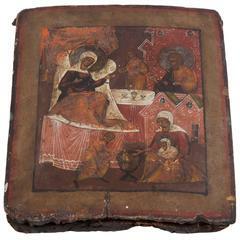 Antique Russian icon depicting the nativity of Mary. Egg tempera on wood. 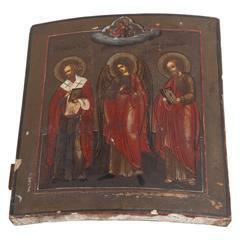 19th century Russian icon depicting three saints and Christ. 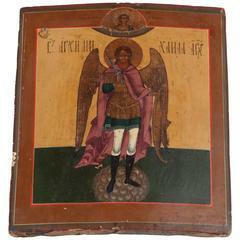 19th century Russian icon of Archangel Gabriel. Polychrome on wood.